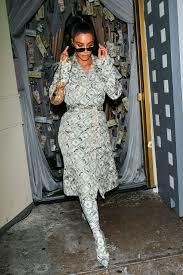 We have recently seen Kim Kardashian looking fabulous in a vintage Jeremy Scott money-covered trench coat. If you feel as inspired as us, you can use our dress rental site, hire a dress and satisfy your fashion craving for less! 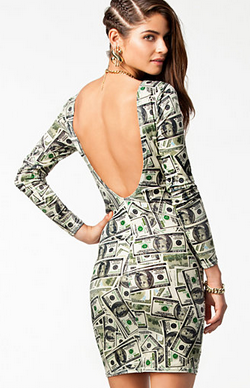 The money print look is definitely risky and bold and you might perhaps find yourself in the situation of not wanting to invest in such a piece that you wouldn’t see yourself wearing many times over the years but wanting to have fun with fashion and recreate your own version of Kim Kardashian’s money look. Well we are here to help. Dress hire is definitely the option for you, now you can rent a dress uk. Get the look with this designer dress hire uk from Estradeur . Pair it with your favourite minimal heels and let the money dress do all the work. Posted October 1st, 2018 in Features. Tagged: borrow a dress, designer dress hire, Designer Dress Hire UK, Dress Hire, dress hire glasgow, dress hire london, dress hire UK, dress rental, dress rental london, dress rental uk, girls meets dress, hire a dress, hire a dress UK, hire designer dresses uk, hire dress, Hire dresses, rent a dress, rent a dress london, Rent a dress uk, Rent designer dresses, rent designer dresses uk, rent dress london, rent dresses uk, rent the runway uk, Rent the Runway UK equivalent.